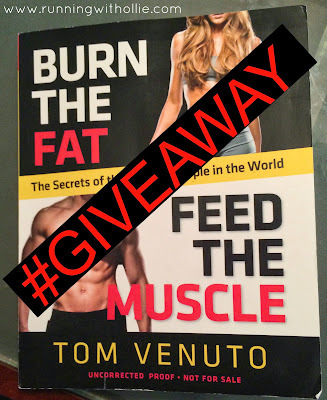 RUNNING WITH OLLIE: Burn the Fat Feed the Muscle: A Book Giveaway! Disclosure: I was provided two copies of Burn the Fat Feed the Muscle free of charge for the purpose of a blog review and a giveaway. I was not compensated in any other way. All opinions are my own, and I am not obligated to give it a positive review. If I hated it, I'd tell you. Remember the first cassette tape you ever bought? How about your first CD? Do you remember your first eBook? I do. It was Midnight Oil, Depeche Mode and Tom Venuto, respectively. 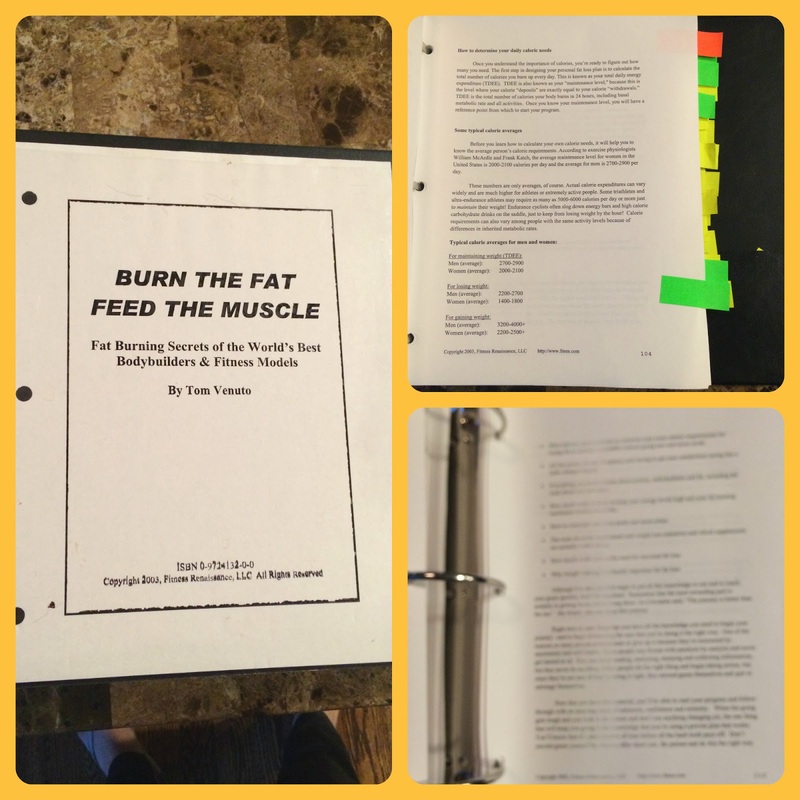 Quite a few years after purchasing my first cassette tape and my first CD, back in 2005 or 2006, I purchased an eBook called "Burn the Fat Feed the Muscle." I was originally drawn to the book because it promised to provide the secrets of fitness models and professionals. I had been running for a few years and this was the book that I bought to get me to the next level with resistance training. I shelled out my $39.99 (or whatever it was at the time, my memory is not that great) and I downloaded the 313 page e-book to my computer. All was dandy until I decided it would be much easier to read this book if I could print it out. I loaded up my printer with fresh paper and proceeded to print all 313 pages + the bonus materials. I blew through several reams of paper and a lot of time on that trusty old ink jet. The last dozen pages of the book show signs that my ink cartridge couldn't handle Burn the Fat. He should have called the eBook Burn the Ink, Feed the Paper. I bought a fat black three ring binder, began a considerable relationship with a three-hole-punch, and started reading. I realized quickly that this was a wealth of information, probably all I would ever need to read again about health and fitness. I immediately cancelled my health magazine subscriptions that spent month after month promising the secret to flat abs, because this book made me realize that magazines just rehash the quick fixes that sell magazines. Health and fitness is not about quick fixes. After finishing the book I felt like I just took the quick course in fitness 101. This eBook single handily provided me with the solid base of health and fitness knowledge. I went from knowing basically nothing (except fitness magazine rhetoric which changed from month to month) to having a very solid understanding of fitness and nutrition basics. I was thrilled all these years later to have the opportunity, through my connection with Fitfluential, to review a paperback version of the book. What? I get to hold a reasonably sized book in my hands? There's going to be a hardback version of this book, so future generations don't have the hardships of three-ring binders, hole punchers, and ink jet printers like I did? Nothing could make me happier. I needed to get my hands on this epic book; an actual book. I was so excited. EAT! Don't starve yourself. Your body doesn't know the difference between dieting and starving. Eat properly to fuel your body for the activity that you are doing (or need to be doing). Starving and skinny is not the goal. Every single person is different, so you can not base your fitness and nutrition plan based on what works for someone else. There is no one-size-fits-all when it comes to fitness and nutrition. Build your own ever-evolving plan using the basics outlined in this book. Tracking progress (and non-progress) is probably the most important thing you can do, so that you can continually make changes as needed based on your own personal progress. You can't fix what you don't know. This book gives you the basics to get started, the knowledge and power to progress, and the motivation to keep going, no matter what. This book for is suitable for beginners, as well as the experienced. If you hit a plateau, and don't know what to do next, this book provides the guidance and resources you need to keep moving forward towards your goals. Someday I'll tell my grandkids about cassette tapes, my first eBook, ink jet printers, and three ring binders, and they won't believe we ever lived in such backward times. I know you'll want to get your hands on this book (It's an actual book!). It is available to purchase on December 10th, but who has the patience to wait that long? 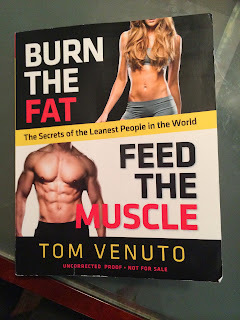 I have a paperback copy of this book that Tom Venuto himself sent me to giveaway to you! Want to win it way before you can buy it? All you have to do is leave me a comment telling me why you want to win, and then enter on the the Rafflecopter form. I'd love for you to read this book and love it the way I did. Contest runs from 10/31/13 until 10/07/13. Winner will receive a paperback copy of Burn the Fat Feed the Muscle book. 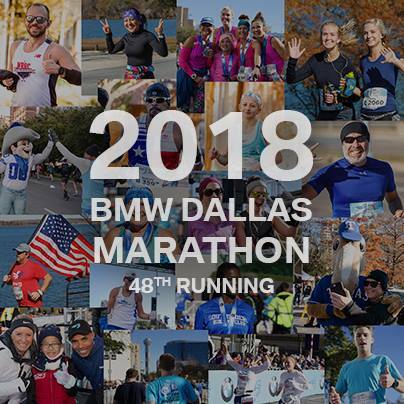 Prize was provided by Tom Venuto and will ship from Running with Ollie in Fort Worth Texas. 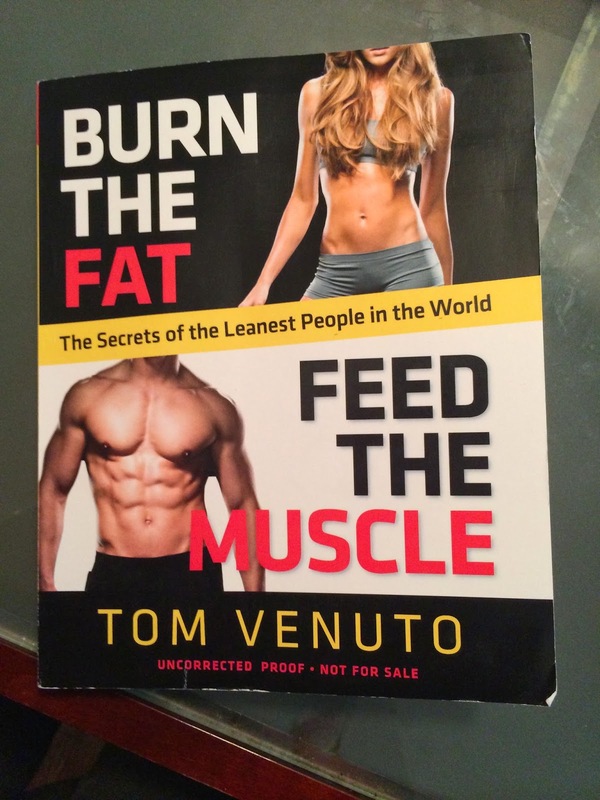 You can pre-order Burn the Fat Feed the Muscle on Amazon here. Always looking for ways to increase fitness! I had a baby 6 months ago, and even though I've lost the weight things aren't quite the same ;) I would LOVE to have this to help me get to where I want to be! This book sounds like just what I need to get the motivation and knowledge to go on to the next level! Great review! And how nice that you were given an extra copy to give away! I have been following one of Tom's programs for about 10 weeks now. I'd love to win! 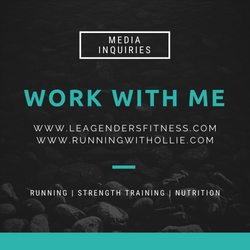 I have been running for years, but just started focusing on my diet and strength training this summer. I'd love to have Venuto's book as a resource to educate me and keep me motivated! I should team up with you on this blog post!! I've been really struggling with my relationship with food lately. I'm trying to learn how to fuel without over indulging. Your description of this book sounds perfect for what I am looking for. I would love to win! I need to rev up the weight loss and fitness this winter! This seems like a neat book, I would love to win. This book sounds great, I just finished my fitness trainer program, and am studying to become a nutritionist that is a long time coming, but anything to do with fitness and nutrition I love! I would be so excited to win this book! This looks like a really interesting read! 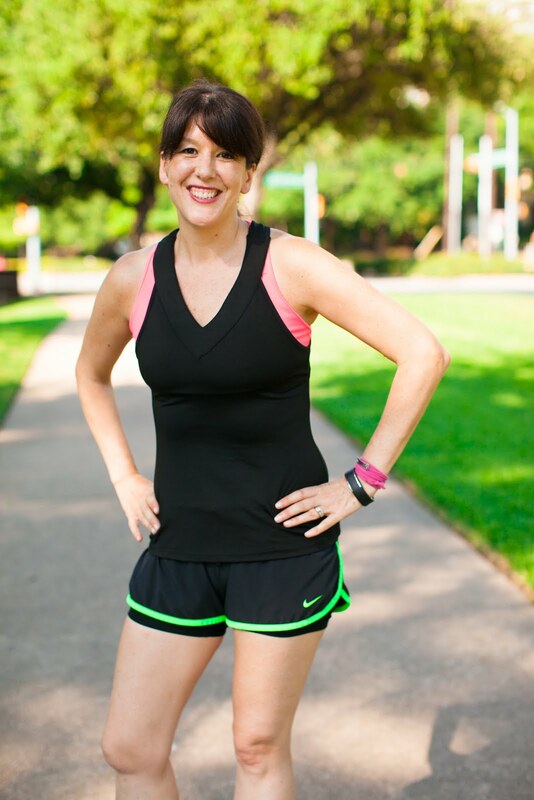 I'm always looking at ways to be healthier, so that's why I'd like to win the book! I'm very interested. I need help! This post provides a fun trip down memory lane, and an accurate perspective on an excellent book (yes, years ago, I bought the e-book, too). I would love to get my hands on the prepublication paperback! :-) Count me in! I'd love to win because I'm very into weight lifting and always trying to find ways to bulk without the unnecessary fat. Thanks for the review. Sounds like some good motivation. Thanks for this review. I'm always looking for motivation for my continuing weight loss journey. 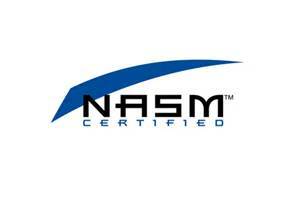 LOVE that it's just simple, no nonsense info vs a "quick fix"! I need this book to possibly help pull me out of this slump I'm in. I'm just reading this now, so I missed the contest, but the book sounds great. I am going to have to pick up a copy!